Many years of experience with the working processes and requirements of our customers led us to develop an alternative cleaning system. The term alternative is appropriate, because in contrast to using conventional washing machines we have taken a completely different path. Whereas they work with wash emulsions everything remains dry on our cleaning system equipped with a linear brush unit – but it is just as thorough! 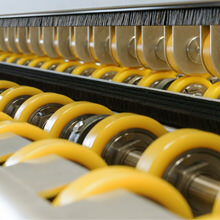 Our dry cleaning system is suitable for material widths from 500-4500 mm. It cleans individual profiled sheets of metal, galvanised blanks, tailored blanks and much more. The system not only effectively removes interfering particles, but at the same time it also homogenizes the basic lubrication of the material to be cleaned and makes an overall contribution towards protecting the forming tools. Top and bottom brushes – we use market leading products from Wandres Inside – operate at 90° to the direction of material throughput. The brush takes up the dirt, which is then subsequently removed from the brush by a rotating scraper at the peripheral point. The cleaning system is housed in a solid steel frame, fulfilling the conditions for deployment in a press shop by design. The infeed and outfeed rollers as well as the blanks guidance devices are distinguished by their particularly rugged construction. We offer the option of controlling the cleaning system and our lubricating systems – it is generally combined with the spray systems – with just one single controller, which is a significant price benefit. You wish to learn more about the technical characteristics and fields of applications of our dry cleaning system? the system at first hand!